“World's Most Perfectly Developed Man"
Charles Atlas earned the immortal title, "The World's Most Perfectly Developed Man." He was chosen by a cross disciplined group of health and medical experts, educators, anthropologists, scientists and doctors who viewed Atlas as the perfect male body and placed his physical measurements on file for posterity. 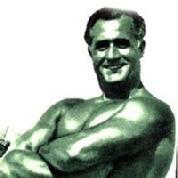 Charles Atlas has been called the founding father of modern-day body building and fitness. A statue of Hercules in the Brooklyn Museum changed the life of Mr. Atlas and subsequently millions of his devoted students. Mr. Atlas credited the heroic statue he first saw as a boy for inspiring him to attain physical perfection. In 1921 and 1922, Bernarr Macfadden , an authority on fitness, health and nutrition who also published "Physical Culture" magazine, sponsored and promoted a natural bodybuilding competition entitled "The World's Most Perfectly Developed Man?" in Madison Square Garden in New York City. In both years, Charles Atlas won. After the second victory, Mr. McFadden decided to stop promoting the contest because he felt Charles Atlas would always win and there would be no competition. Charles Atlas has been a perfect role model, a friend to millions and an American Icon and Charles Atlas, Ltd. remains one of the oldest American companies still in operation.